So I mentioned how Steampunk isn't really my genre in my review of The Girl in the Steel Corset, the first book in the series, but that it had managed to convince me not to give up on the genre entirely, cause I really enjoyed The Girl in the Steel Corset! 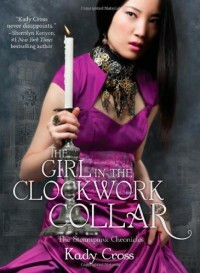 So when I saw the sequel, The Girl in the Clockwork Collar, on NetGalley I just HAD to request it! I'm really liking the character development all of the main cast is going through and getting to know them better was wonderful! Finley is still the kickass girl she was in the first novel and is trying to figure out what it is exactly that she wants now that her 2 halves have been merged for the most part and just basically discovering who she is. I loved that with her it's not all black and white. She has a good heart, but she's also attracted to the darker side of things and I loved watching her figure it all out and owning up to her struggles with it. And Griffin... That boy is still as swoonworthy as he was in The Girl With The Steel Corset, even when I sometimes wanted to slap him on the back of his head to FINALLY GET ON WITH SOME STUFF I WON'T MENTION! I love the chemistry between him and Finley and am really very much appreciative of there not being insta-love between them, because that is one of the biggest pet peeves I have when it comes to novels! The abilities of all these characters we meet again are immensely interesting and I didn't feel that this book suffered from second book syndrome at all! There's enough action and definitely plot progression so I was rather enjoying myself reading it. There's some build up to what I think we will find out more about in the third book and I'm already anticipating a lot of angst and drama and an EPIC BATTLE. I do have to say that the characters still seem a lot older in their behaviour than their actual age. If I didn't know they were teenagers, I'd say they were all about 23-25. This kind of bugged me at times, because I kept having to remind myself they were a lot younger than they appeared. So basically this is a wonderful steampunk series and I'm sticking with it cause I can't wait to find out how it will all end! Even recommended to non-fans of the genre, the writing and characters are good enough on themselves!